The Forth Bridge has been voted Scotland's greatest man-made wonder. 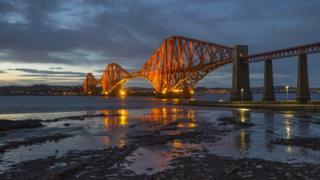 A Unesco World Heritage Site, the 126-year-old bridge took almost a third of the votes in a survey by VisitScotland. It beat landmark sites including Edinburgh Castle, The Kelpies and the Glenfinnan Viaduct to take the top spot in the poll. The vote was carried out by the national tourism organisation to mark Scotland's year of innovation, architecture and design. It also found that almost 60% of Brits had made an "architectural pilgrimage" in the UK, travelling to see a famous building or structure. Malcolm Roughead, chief executive of VisitScotland, said: "It is no surprise that our awe-inspiring Forth Bridge has taken the top spot in this research and it is wonderful to see that new man-made wonders like The Kelpies are already proving a hit with visitors." He added: "2016 has shone a significant spotlight on Scotland's achievements in innovation, architecture and design through a wide range of activity designed to boost tourism in Scotland. "I hope many people continue to make architectural pilgrimages to Scotland throughout the rest of this year and beyond to discover some of our truly remarkable sights."